As part of our latest webcast on the creation/editing of batters in Advanced Road Design, we also showed how you can resolve overlapping batters using a number of different methods. We often get asked by users of Advanced Road Design questions like, “What is the best data to request from a surveyor to create an existing surface? ” and “Can I create a surface from contours for use with Advanced Road Design?“. In this article, we are going to discuss the different types of data that you can use to build a surface for use with Advanced Road Design, and we will also analyse the accuracy of these different types of data. Part 1 – What data should I request from the surveyor to create a surface? We always tell our users that the best format to request from a surveyor is an AutoCAD DWG file that contains the 3DFace entities or Line entities that represent the TIN. It is important that the TIN has been created to include breaklines to ensure the surface is accurately represented. A triangulated irregular network (TIN) is a data structure used to represent a surface model. The triangulation is initially calculated using the Delauney triangulation algorithm, however surveyors will further manipulate this triangulation to accurately reflect grade breaks across the surface. This is achieved by adding breaklines or swapping edges. When a TIN is created using the Delauney algorithm, the triangulation may not initially accurately reflect the actual surface. The images below show how the same group of points triangulated differently can result in two completely different results. In example 1, the triangle edge is formed between the points with an elevation of 100 and in example 2, the triangle edge is formed between the points with an elevation of 95. The interpolated elevations on the TIN are completely different. A breakline is used by a surveyor to force the triangulation to form a certain way. When a breakline is added to a TIN surface, triangle edges that cross the breakline are removed and the TIN is recalculated. If we wanted to force the triangulation of example 2 to be the same as example 1, than we would need to create a breakline between the two points with an elevation of 100. All triangles that currently cross the breakline would be removed and then re-added, so that no edges crossed the breakline. Whilst onsite performing the survey, the surveyor will typically define string points, which will be used to later represent the geometry of the breaklines. Survey points that are used as part of a string are often located where there is an immediate change in grade on a surface, i.e., the centreline of a road, the top of kerb & channel, or the top of an embankment. Therefore, it always best to use the TIN that has been supplied by the surveyor. Not only have the surveyed points been triangulated, but breaklines have been added by the surveyor to ensure that the surface has been accurately captured. Part 2 – Can I use an AutoCAD DWG file containing the contour lines to create a surface? AutoCAD Polylines representing the contour lines can be used to create a surface, however this data is certainly NOT as accurate as a TIN that has been created by a surveyor. Contour lines allow for humans to be able to interpret surface undulations and shouldn’t be used for computers to generate a surface model. Surface models created from contour lines might be useful to calculate large catchment areas or to represent large terrain beyond the design area, but this data should never be used for detailed design. 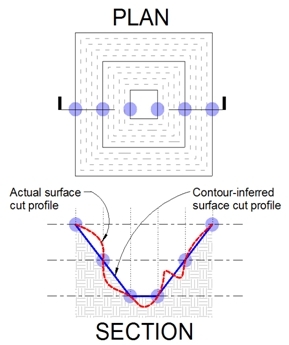 In the image below, you can see how a surface created from contour lines does not accurately represent the irregularities of the wall shape in a section view. We conducted a test using AutoCAD Civil3D whereby we created a surface from contour lines and then compared this surface against the original TIN surface. Below is map showing areas where the elevations were greater and less than 100mm of the original terrain. The contours were set to a 1m interval. Note: Red areas show where the elevation difference is more than 100mm in cut and the blue areas show where the elevation difference us more than 100mm in fill. The largest elevation difference between the two surfaces was 1.5m. The volume difference was 8000 Cu. M over a surface area of 250 sq. m.
It is NOT recommended that designers create a surface from the contour lines for detailed design. 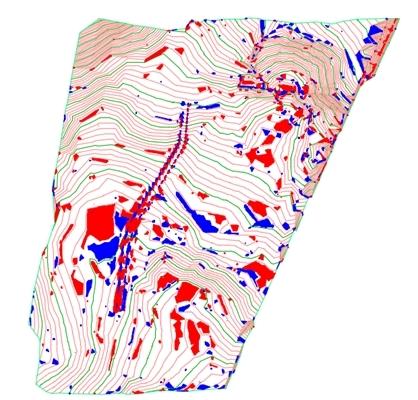 Part 3 – How do I create a Civil3D Surface from TIN data supplied by a surveyor? If you receive an AutoCAD DWG file containing the TIN from a surveyor, the first thing you should do is copy and paste the data into a new DWG file that has been created using your own Civil3D drawing template. If you start creating Civil3D objects in the DWG supplied by the surveyor, than it is most likely you will be working in feet and your Civil3D Styles won’t be available. 1) Select on one of the 3DFACE objects in the surveyors drawing and use Select Similiar to select all 3DFACES entities. 2) Open up a new Civil3D Drawing using your own Civil3D Drawing Template. 3) From the Home tab on the Ribbon, select the fly-out button on the Paste command and select Paste to Original Coordinates. 4) Type the command AECLINEWORKSHRINKWRAP at the command line and select all 3DFACES. This command will generate a polyline around the extents of the 3DFACES, that can be later used as a surface boundary. 5) Create a new Civil3D Surface. From the Prospector, expand out the new surface, expand out Definition and right-click on Drawing Objects and select Add. 6) A dialog box will display, select 3DFACES from the drop-down and tick ON Maintain Edges from Objects. Ticking this option on will ensure that the new TIN created is an exact replica of the TIN created by the surveyor. 7) From the Prospector, right-click on Boundaries and select Add. 8) A dialog box will display, select the type Outer and tick ON Non-destructive breakline. Select polyline created early using the shrink wrap command. You have now created a Civil3D Surface using the TIN supplied by the surveyor. This surface can now be used as the sampled surface for use with Advanced Road Design. Part 4 – What are some other data types that can be used to create a surface? ASCII Point File A TIN surface can be created from an ASCII Point file, however the issue with using this format is regarding the adding of breaklines. If 3D Polylines have been supplied in the DWG, than these should be added to the surface as breaklines. 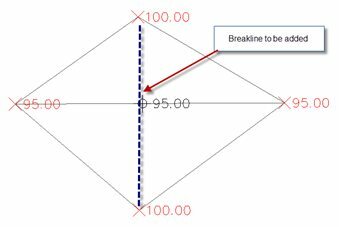 Refer to Part 1 of this document regarding the importance of breaklines. Point Cloud Data Point Cloud data is becoming more prevalent these days and it is a great format to use for detailed design.The issue with Point Cloud data is that this data often needs to be simplified before a surface is created. A TIN created with millions of triangles can affect the performance of the project inside CAD, so it is recommended that users create the surface using the GRID format.As there are millions of points being scanned, it is often not necessary to add breaklines to the TIN. GIS Data Surface data from GIS can be used to create a surface for use with Advanced Road Design, however designers should be well aware of the source of this data. It is important to know whether the data was created from LIDAR, imagery, contours, points etc. These different data types will have an impact on the accuracy of the surface. Although the GIS surface might be in a TIN format, this does not mean that the surface is accurate. The age of the data should also be taken into consideration. It is important that civil designers are confident that the survey data that they are using for detailed design is accurate. If the survey data being used is inaccurate than the final design levels, volumes, or design TIN may not be correct. There have been many examples where design from an inaccurate survey has caused issues on projects. We always recommend that designers use the TIN created by the surveyor who was onsite performing the survey. Just because a TIN surface can be created from contour data or other sources does not mean that it is accurate data, which is suitable for detailed design. Advanced Road Design has an Export and Import connection to HEC-RAS. This video shows how this can be achieved in around 4 minutes. Sections exported to HEC-RAS contain Bank locations, with Mannings values, without the need for flipping. The import from HEC-RAS enables a ‘water’ surface to be created which can be utilised for any purpose including displayed on cross sections. In the last video of our road reconstruction series, we show you how you can re-model a cul-de-sac. The horizontal geometry of the cul-de-sac was created by the designer after using the Autodesk Vehicle Tracking software. The crown of the cul-de-sac is created as a string and added to the final automated design model. If you have suggestions for a webcast or video series, please don’t hesitate to contact me – andrew.banson@civilsurveysolutions.com.au. In this video, we show you how you can match a road into the edge of an existing road and re-model an intersection. In this example, a ‘road object’ is created out of alignment running along the existing edge of the road. An intersection between both roads is detected, which allows for the use of the ARD Kerb Return commands. In this video, we show how you can insert an offset crown by referencing an existing slope on the road. In this example, the Reference Line tool is demonstrated.